The Market Composite Index, a measure of mortgage loan application volume, decreased 4.1 percent on a seasonally adjusted basis from one week earlier. On an unadjusted basis, the Index decreased 2 percent compared with the previous week. The Refinance Index decreased 2 percent from the previous week. The seasonally adjusted Purchase Index decreased 6 percent from one week earlier. The unadjusted Purchase Index decreased 3 percent compared with the previous week and was 4 percent higher than the same week one year ago. The refinance share of mortgage activity increased to 46.5 percent of total applications from 46.4 percent the previous week. The adjustable-rate mortgage (ARM) share of activity increased to 6.3 percent of total applications. The FHA share of total applications decreased to 10.1 percent from 10.4 percent the week prior. The VA share of total applications remained unchanged at 10.1 percent from the week prior. The USDA share of total applications increased to 0.8 percent from 0.7 percent the week prior. The average contract interest rate for 30-year fixed-rate mortgages with conforming loan balances ($453,100 or less) increased to its highest rate since January 2014, 4.57 percent, from 4.50 percent, with points increasing to 0.59 from 0.57 (including the origination fee) for 80 percent loan-to-value ratio (LTV) loans. The effective rate increased from last week. The average contract interest rate for 30-year fixed-rate mortgages with jumbo loan balances (greater than $453,100) increased to its highest rate since January 2014, 4.55 percent, from 4.47 percent, with points increasing to 0.47 from 0.44 (including the origination fee) for 80 percent LTV loans. The effective rate increased from last week. The average contract interest rate for 30-year fixed-rate mortgages backed by the FHA increased to 4.54 percent from 4.47 percent, with points increasing to 0.73 from 0.69 (including the origination fee) for 80 percent LTV loans. The effective rate increased from last week. The average contract interest rate for 15-year fixed-rate mortgages increased to its highest rate since April 2011, 4.00 percent, from 3.92 percent, with points increasing to 0.65 from 0.65 (including the origination fee) for 80 percent LTV loans. The effective rate increased from last week. The average contract interest rate for 5/1 ARMs decreased to 3.74 percent from 3.77 percent, with points decreasing to 0.37 from 0.42 (including the origination fee) for 80 percent LTV loans. The effective rate decreased from last week. The 30 days or more delinquency rate for November 2016 was 5.2 percent. In November 2017, 5.1 percent of mortgages were delinquent by at least 30 days or more including those in foreclosure. 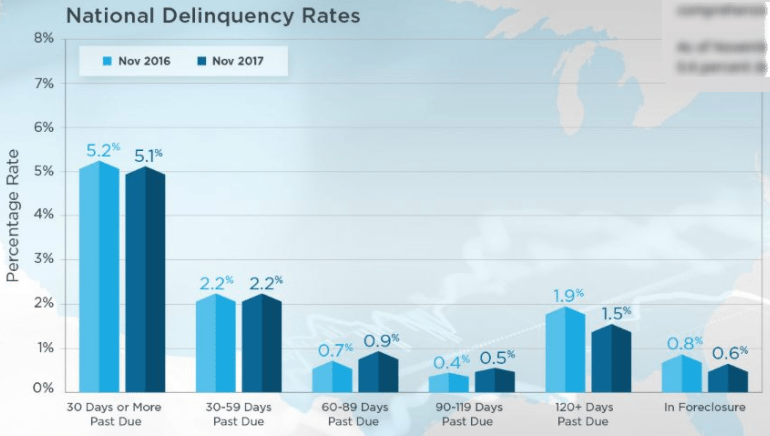 This represents a 0.1 percentage point decline in the overall delinquency rate compared with November 2016. As of November 2017, the foreclosure inventory rate was 0.6 percent down from 0.8 percent in November 2016. The Mortgage Bankers Association (MBA) Builder Application Survey (BAS) data for January 2018 shows mortgage applications for new home purchases increased 18.4 percent compared to January 2017. Compared to December 2017, applications increased by 34 percent. This change does not include any adjustment for typical seasonal patterns. By product type, conventional loans composed 71.7 percent of loan applications, FHA loans composed 15.3 percent, RHS/USDA loans composed 1.2 percent and VA loans composed 11.7 percent. The average loan size of new homes decreased from $339,203 in December to $338,918 in January. The MBA estimates new single-family home sales were running at a seasonally adjusted annual rate of 700,000 units in January 2018, based on data from the BAS. The new home sales estimate is derived using mortgage application information from the BAS, as well as assumptions regarding market coverage and other factors. The seasonally adjusted estimate for January is an increase of 26.4 percent from the December pace of 554,000 units. On an unadjusted basis, the MBA estimates that there were 54,000 new home sales in January 2018, an increase of 35 percent from 40,000 new home sales in December. “Mortgage applications for new homes surged in January and were up 18 percent on a year over year basis,” said Lynn Fisher, MBA vice president of research and economics. “This complements other positive news on US job growth suggesting that economic fundamentals are strong. The Mortgage Bankers Association (MBA) projects commercial and multifamily mortgage originations will decline slightly in 2018, ending the year at $549 billion, down three percent from the 2017 volumes. MBA expects volumes to remain at roughly that level in 2019 as well. MBA forecasts mortgage banker originations of just multifamily mortgages at $248 billion in 2018, with total multifamily lending at $271 billion. After strong growth in recent years, multifamily lending is expected to hold roughly steady in 2019. Commercial/multifamily mortgage debt outstanding is expected to continue to grow in 2018, ending the year more than seven percent higher than at the end of 2017. “Rising interest rates, slowing NOI growth, pressure on capitalization rates and fewer loan maturities are some of the factors that will be holding the markets back. “At the same time, continued economic growth, large amounts of investment capital looking for a home — and liking the looks of commercial real estate — and the recent tax reform legislation may all push the transaction markets forward. “The magnitude and opposing impacts of some of these changes, however, raises the level of uncertainty,” Woodwell continued. 6 percent, or $102.2 billion, of the $1.8 trillion outstanding commercial and multifamily mortgages held by non-bank lenders and investors will mature in 2018, a 42 percent decrease from the $175.9 billion that matured in 2017. The loan maturities vary significantly by investor group. Just $13.3 billion (2 percent) of the outstanding balance of multifamily and health care mortgages held or guaranteed by Fannie Mae, Freddie Mac, FHA and Ginnie Mae will mature in 2018. Life insurance companies will see $18.8 billion (4 percent) of their outstanding mortgage balances mature in 2018. Among loans held in CMBS, $34.0 billion (7 percent) will come due in 2018. Among commercial mortgages held by credit companies and other investors, $36.2 billion (22 percent) will mature in 2018. “2017 marked the official end of the so-called ‘wall of maturities’,” said Jamie Woodwell, MBA’s Vice President of Commercial Real Estate Research. “Because many commercial and multifamily mortgages are ten-year loans, and few loans were made in 2008 during the onset of the credit crunch, mortgage maturities will be 42 percent lower in 2018. 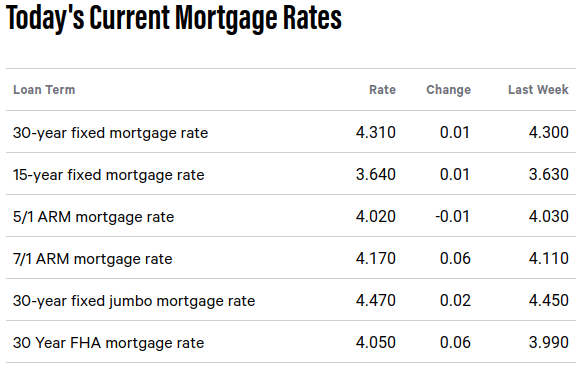 The 30-year fixed mortgage rate on Bankrate.com is currently 4.31 percent. The 15-year fixed mortgage rate is currently 3.64 percent.